There are a tremendous amount of structural benefits baked into the structure of US-dollar-demoninated world trade. 78.5% of all world trade is conducted in USDs; the second-most-used currency, the Euro, accounts for just 5.9%. The greenback remains, by far, the dominant means of worldwide commerce and exchange. 64% of all central bank forex reserves are held in dollars. Foreign countries are heavily incentivized to sell their goods in America, because for them, they receive the one currency that is universally accepted. Global trade is so much easier when every individual participant doesn’t have to concern themselves with perpetual currency exchange rates for their 194 potential trade partners. So obtaining dollars, at given time, is preferable to any central bank vs. obtaining any other currency. Which means that even backing out America’s voracious consumer culture and love affair with debt spending, running a trade deficit is impossible for the US to avoid. Mr. Trump is wildly alienating all the rest of the world, with the threat of Tariffs in order to reduce the Trade Deficit. 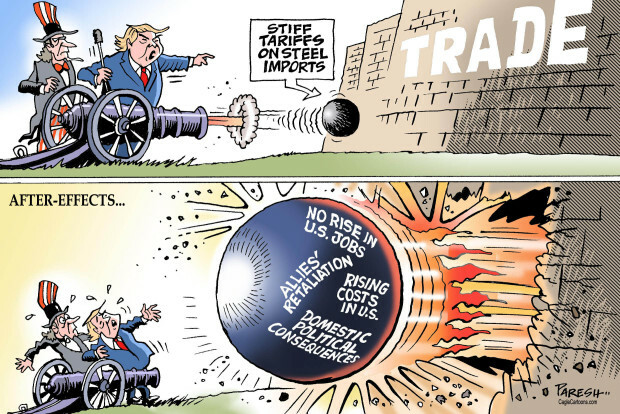 What he does not understand, is that the Trade Deficit is built-in to the US economy, because the world´s central banks need Dollars for their Reserves: that is the System.